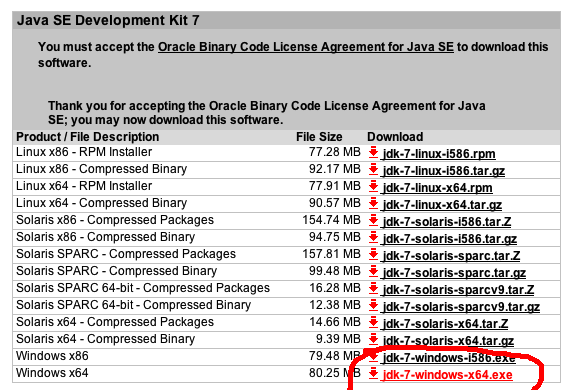 Where do I download Java development binaries (JDK) for Windows 7 64-bit? I am trying to install a Java development environment on Windows 7 64-bit, but I am unable to find a suitable install. Is there one available? The latest Java Development Kit is available at this address. Make sure to select "Windows x64" when asked for the operating system. Choose the appropriate JDK package you want and select Windows x64 on the subsequent page. Not the answer you're looking for? Browse other questions tagged windows-7 64-bit download java jdk or ask your own question.